Jefferson's collection was unique in that it was the working collection of a scholar, not a gentleman's collection for display. 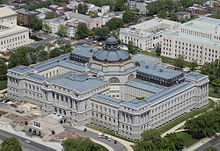 With the addition of his collection, the Library of Congress was transformed from a specialist's library to a more general one. His original collection was organized into a scheme based on Francis Bacon's organization of knowledge. Specifically, he grouped his books into Memory, Reason, and Imagination, which broke down into 44 more subdivisions. 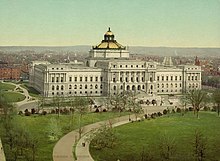 The Library followed Jefferson's organization scheme until the late 19th century, when librarian Herbert Putnam began work on a more flexible Library of Congress Classification structure that now applies to more than 138 million items. 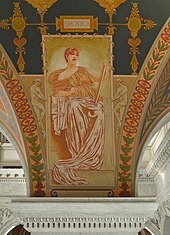 The collections of the Library of Congress include more than 32 million cataloged books and other print materials in 470 languages; more than 61 million manuscripts; the largest rare book collection  in North America, including the rough draft of the Declaration of Independence, a Gutenberg Bible (originating from the St. Blaise Abbey, Black Forest) (one of only three perfect vellum copies known to exist);    over 1 million U.S. government publications; 1 million issues of world newspapers spanning the past three centuries; 33,000 bound newspaper volumes; 500,000 microfilm reels; over 6,000 titles in all, totaling more than 120,000 issues comic book  titles; films; 5.3 million maps; 6 million works of sheet music; 3 million sound recordings; more than 14.7 million prints and photographic images including fine and popular art pieces and architectural drawings;  the Betts Stradivarius; and the Cassavetti Stradivarius. 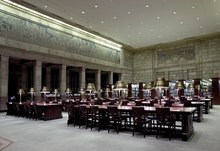 The Library serves as a legal repository for copyright protection and copyright registration, and as the base for the United States Copyright Office. Regardless of whether they register their copyright, all publishers are required to submit two complete copies of their published works to the Library—this requirement is known as mandatory deposit. Nearly 15,000 new items published in the U.S. arrive every business day at the Library. Contrary to popular belief, however, the Library does not retain all of these works in its permanent collection, although it does add an average of 12,000 items per day. Rejected items are used in trades with other libraries around the world, distributed to federal agencies, or donated to schools, communities, and other organizations within the United States. As is true of many similar libraries, the Library of Congress retains copies of every publication in the English language that is deemed significant. ^ " America's 'national library' is lacking in leadership, yet another report finds" by Peggy McGlone, The Washington Post, March 31, 2015. ^ Tsuneishi, Warren (May 1992). "Obituary: Cecil Hobbs (1907-1991)". Journal of Asian Studies. 51 (2): 472–473. doi: 10.1017/s0021911800041607. Aikin, Jane (2010). "Histories of the Library of Congress". Libraries & the Cultural Record. 45 (1): 5–24. doi: 10.1353/lac.0.0113. Shevlin, Eleanor F.; Lindquist, Eric N. (2010). "The Center for the Book and the History of the Book". Libraries & the Cultural Record. 45 (1): 56–69. doi: 10.1353/lac.0.0112.